Kolkata: West Bengal Chief Minister Mamata Banerjee’s dharna (sit-in protest) in Kolkata, which she commenced on Sunday to protest against the Central Bureau of Investigation (CBI) move to enter the house of city police chief Rajeev Kumar to quiz him on chit funds scams, entered its second day on Monday. 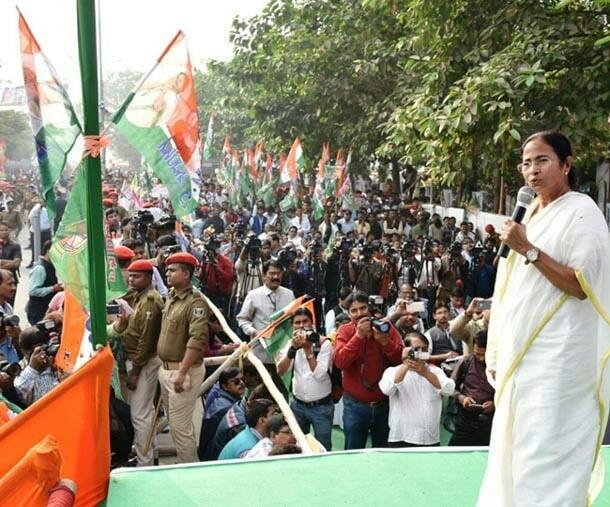 She remained awake for the entire night on a make-shift dias with other ministers and Trinamool Congress leaders. Speaking to reporters, Banerjee said she will continue the ‘dharna’ till the country is saved. Mamata Banerjee said the PM has gone ‘mad’ knowing he will not be re-elected and he is trying to ‘break all constitutional institutions’. Banerjee said she is ready to ‘give up’ her life. “I am ready to die to protect the country,” she said. She announced that her Cabinet meeting will take place near metro channel at 1 pm on Monday. Banerjee directed her party members to start ‘peaceful’ protest across the state on Monday from 2 pm. Union Minister and Bharatiya Janata Party (BJP) MP Babul Supriyo demanded imposition of ‘presidential rule’ in the eastern state where the Trinamool Congress is ruling since 2011. Rajeev Kumar, who was seen emerging after Mamata met him, was wanted for questioning in connection with investigations into several ponzi scams. He did not speak to media. He had headed the special investigation team investigating into the Saradha and Rose Valley scams. Kumar has been accused of tampering with evidence to save several influential people in the state. CBI defended their action. “As we found concrete evidences against Rajeev Kumar, we had summoned him. As he did not respond to our notices, our officers went to his residence in south Kolkata today to quiz him with all valid documents and paper-works,” CBI joint commissioner Pankaj Kumar Srivastava told IBNS after probe agency officials were whisked away from the gate of the residence of Rajeev Kumar and detained in a police station when they went to his residence to quiz him on the Rose Valley and Saradha chit fund scams.